Tofu is a great standby for vegetarians. It can also play a beneficial role in the diet of those who need to watch their cholesterol levels. Tofu is a white soya bean curd which has a multitude of uses. Its rather bland, subtle taste can be enhanced by any number of seasonings and/or marinades to produce sweet or savoury dishes. Tofu is a great substitute for cream, mayonnaise and cheese in cooking. It has few equals in this role. Tofu has less that 5% fat, no cholesterol and virtually no sodium (salt). It is a good source of protein, vitamins and minerals. A third of a cup (75g) of tofu yields only 48 calories or 200 kilojoules. Tofu can be purchased fresh or processed in some way. 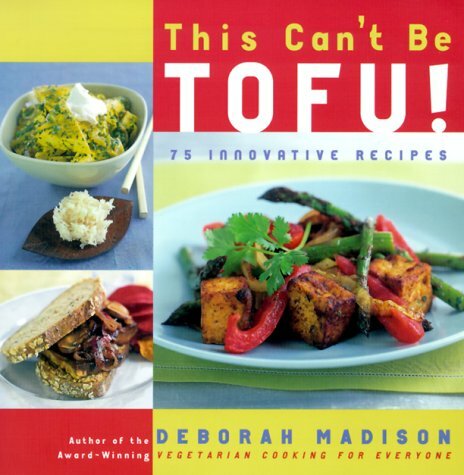 Fresh tofu can be drained briefly or over night if a firmer tofu is required. The first two recipes call for drained, pressed tofu. Place the cakes of tofu on a board on a double layer of absorbent kitchen paper. Cover with two more sheets of paper and top with a baking tray weighted with a heavy can. Tilt the board towards the sink and leave to drain for up to an hour. The following soup recipe will feed six people and yield 184 calories (768 kilojoules) per serve. It is high in fibre, has no cholesterol and is low in sodium. Heat the oil and cook onion, garlic, cumin, coriander, turmeric and chilli powder for 5 minutes. Stir in vegetables and stock. Bring to the boil, reduce heat, cover and simmer for 15 minutes or until vegetables are tender. Use a slotted spoon to remove a cup of the vegetables. Puree in a food processor or blender. Return puree to pan together with tofu and corn. Heat for about 5 minutes. Season to taste and sprinkle with chopped, fresh dill to serve. Stir-fries are so easy and the chicken dish below has only 139 calories (576 kilojoules) per serve. These quantities will serve six. Mix together the ingredients for the marinade. Add tofu and chicken, toss to coat and leave for 30 minutes. Drain but reserve marinade. Heat oil in a wok or frypan. Cook tofu, chicken and ginger until chicken is just cooked – about 5 minutes. Remove tofu and chicken. Set aside and keep warm. Add capsicums and cook for 3 to 4 minutes. Return chicken and tofu to pan, toss to combine. Mix cornflour mixture with reserved marinade. Add to pan and stir till mixture boils and thickens. Add shallots, bean sprouts and sesame seeds. Toss and serve immediately. Tofu is just as versatile in sweet dishes. The following recipe makes a great sauce to serve with fresh fruit. With a low 14 calories (60 kilojoules) per serve, it is ideal for weight-watchers as well as those suffering from high cholesterol. The following ingredients will make two cupfuls. 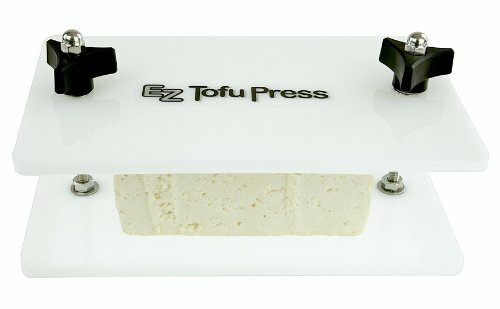 EZ Tofu Press - Removes Water from Tofu for Better Flavor and Texture. Comes With Bonus Nasoya Tofu Coupons. tofu brick in 5 to 15 minutes. Process or blend all ingredients until smooth. Cover and chill. Stir well before serving. Apart from the Sesame Chicken Stir-Fry, these recipes have no cholesterol whatsoever so are great choices. They have plenty of flavour so I'm sure you'll enjoy these.